This season’s Black Friday shopping forecast warns for earlier than ever opening times, limited quantities of items specifically made for that day, price matching guarantees, and unheard of deals. With many consumers facing a limited budget, retailers are looking for the hottest ticket items to draw customers in. Because many stores depend on the after Thanksgiving shopping season to bring in their highest profits, their hope is that once the customer enters the door, they will be enticed by other deals. 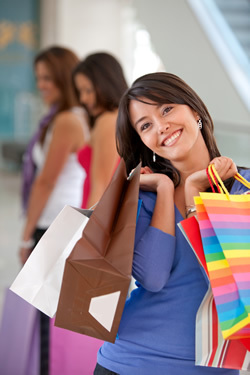 Last year more than 195 million customers spent the day after Thanksgiving shopping. So what does incredibly marked down hot items, limited quantities, and thousands of competitive consumers in one store mean for your customer service representatives? Well, first off your cashiers will have to report to work at 2 AM (or even earlier if you are one of the lucky ones participating in Walmart’s first ever Midnight opening). They will also ring up thousands of items to hundreds of customers in a very short span of time. Aside from the busy morning, your cashiers will also be responsible for checking identification, scanning for possible retail theft, and deactivating alarm bar-codes. Add competitive customers anxious to check out and move on to the next store, and your cashiers may quickly become cranky and aggravated. However, how your cashiers act on Black Friday (and any other day of the year) directly affects your business. Should your cashier treat even one customer badly, the 10 others following in line will witness it. Your cashiers’ actions represent your store. Should customers get offended, they may quickly take their business elsewhere. If you think your $198 television deal will entice customers to choose your store, you’re wrong. They may purchase from your business that day simply for the deal. However, their experience will affect any future business they give you. 1) Get a good night’s sleep. If you have to get up at 1 AM, you need to go to bed earlier and get your 6-8 hours. 3) Eat before you come in. You may not get a break for hours. 4) Even if you are busy, take the time to check identification if the credit or debit card is not signed. Credit card theft is on the rise during the holidays. 5) Check for counterfeit bills. It may take a few extra seconds, but most likely your customers are purchasing expensive items with $100 bills. Just a few counterfeit bills at the end of the day may jeopardize your job. 6) While you may want to get as many people through as quickly as possible, rushing while counting money almost guarantees making errors. If you don’t give the customer enough money, you may need to take time to count your drawer and note the discrepancy. If you give the customer too much change, they aren’t likely to tell you. 7) Smile and greet each and every customer. You don’t necessarily have time for small talk, but, if the customer has a large order, try to engage them a little. The customer will focus on your friendliness, compared to the time it is taking to ring up 20 items. Meanwhile, customers further back down the line will appreciate the pleasantness. 8) There may be 50 people in line behind the customer. However, the present customer deserves 100% of your attention. 9) Handle the customer’s items with care. If you are busy, it may be easy to just throw a camera or electronic item in a bag. However, many of the hot ticket items are pricey electronics. Take care in handling and bagging the items. 10) Be pleasant. If you start the day off miserable and complaining, there is little room for improvement. Although the holiday shopping season may be demanding for cashiers, it usually means a profit increase for the store. Ensure customer satisfaction, and in turn, customer retention by educating your cashiers on customer satisfaction. Aim not only for immediate profit but also for customers who will come back to buy more.